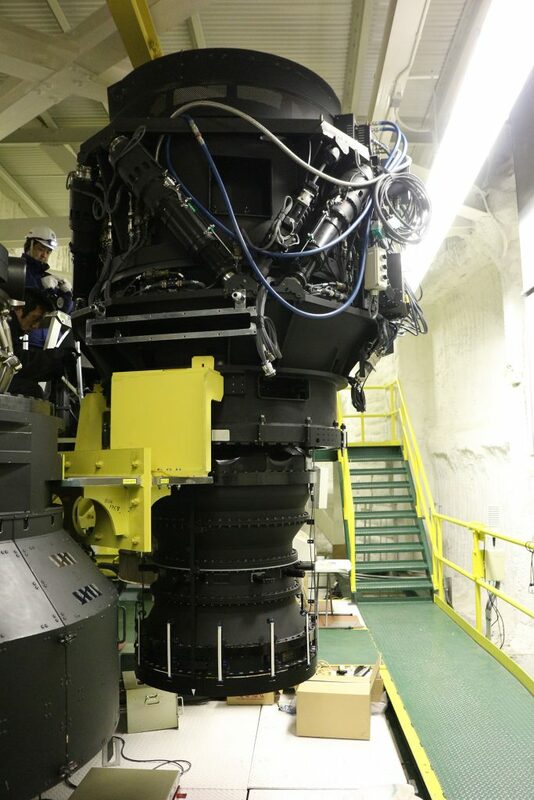 Hyper Suprime-Cam (HSC) is a gigantic digital imaging camera for the 8.2 m Subaru telescope built by National Astronomical Observatory of Japan in collaboration with international academic and industrial partners. Because the telescope is large, its camera is also large; it is taller than human being and it weighs about three tons. The camera consists of lenses, filters, shutter and light sensors. The 116 sensors are each highly sensitive 2Kx4K deep depletion Hamamatsu CCDs. The camera has a total of 870 Megapixels, covering a field of view of 1.8 deg2, 1.5 degrees in diameter. These CCDs are installed inside a vacuum cryogenic dewar and are operated at -100 C, at which point the dark current is negligible. The diameter of the first lens is 820 mm and the length of the lens barrel is 1.65 m. Mechanical alignment of optics (e.g. focus adjustment) is realized by a precision hexapod system consisting of six customized actuators. The system saw the first light in summer 2012 and is now a facility instrument on Subaru. 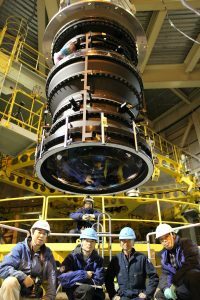 The Hyper Surime-Cam Project is supported by Grants-In-Aid (JSPS, MEXT), ASIAA, Princeton, IPMU and NAOJ. For detailed parameters of the instrument, refer to this page. HSC in standby on the TUE floor. 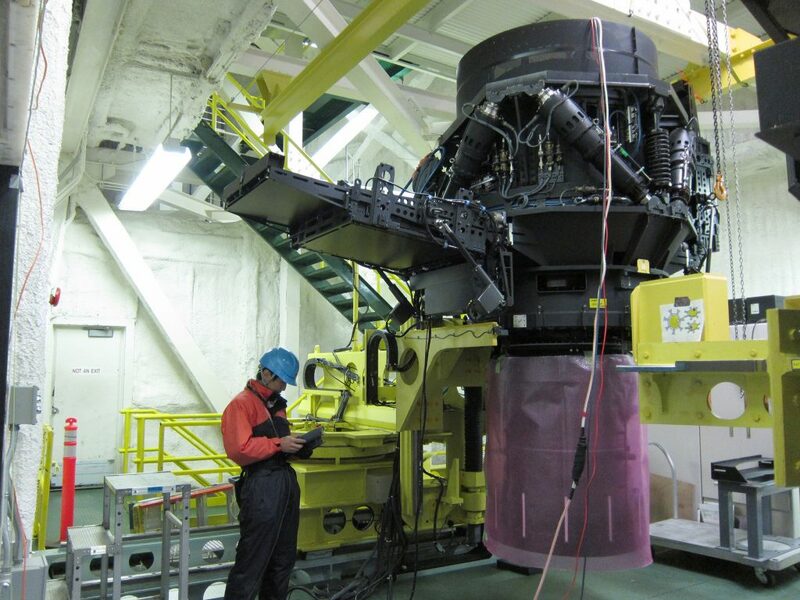 Wide-field corrector just about to be assembled. The wide-field corrector (WFC) is composed of five lenses and one atmospheric dispersion corrector (ADC) element. The first lens has an effective aperture of 820 mm and each of five lenses has aspherical surface on both side. Thanks to the high quality of the glasses (with homogeneity of a few ppm) manufactured by glass vendors (Ohara for BSL7Y and PBL1Y, Corning for synthetic silica) and precision polishing technique developed by Canon, the camera has excellent image quality over the 498 mm diameter focal plane. The ADC uses the same lateral-shift approach adopted by Suprime-Cam, and corrects the atmospheric dispersion down to 30 degree elevation. The lens barrel is made of Cordierite which is a low-thermal-expansion light-weight ceramic. 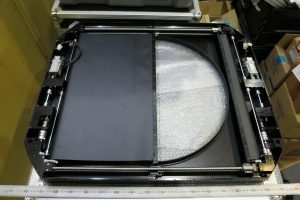 A large uniform and defect-free blank provided by Kyocera is still enough to ensure good alignment of lenses at any telescope elevation. 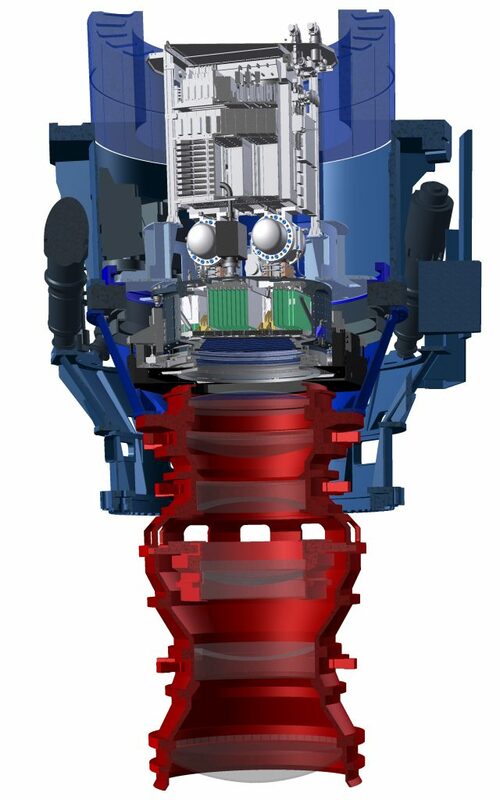 The fully assembled WFC has a diameter of 970 mm and a height of 1.7 m.
The main function of the prime focus unit (PFU) is to align the axis of the WFC and CCD dewar to the optical axis of the telescope at any telescope altitude and to correct the field-rotation caused by tracking. Six actuators attached to the outside of the PFU control the alignment of the WFC and CCD dewar. 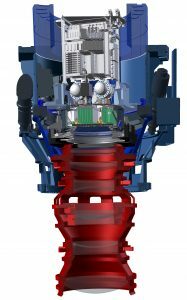 PFU is also equipped with a large cross roller bearing and a pair of motors which work as an instrument rotator. The accurate motion of the PFU (1 micron in translation and 1 milli-arcsec in rotation) is key to realize the excellent image quality achieved by the WFC. Mitsubishi Electric, which is experienced in precise motion control of large mechanics, designed and manufactured the PFU. Prime focus unit before assembly. The heart of HSC is the CCD dewar , where photons from distant galaxies are recorded. 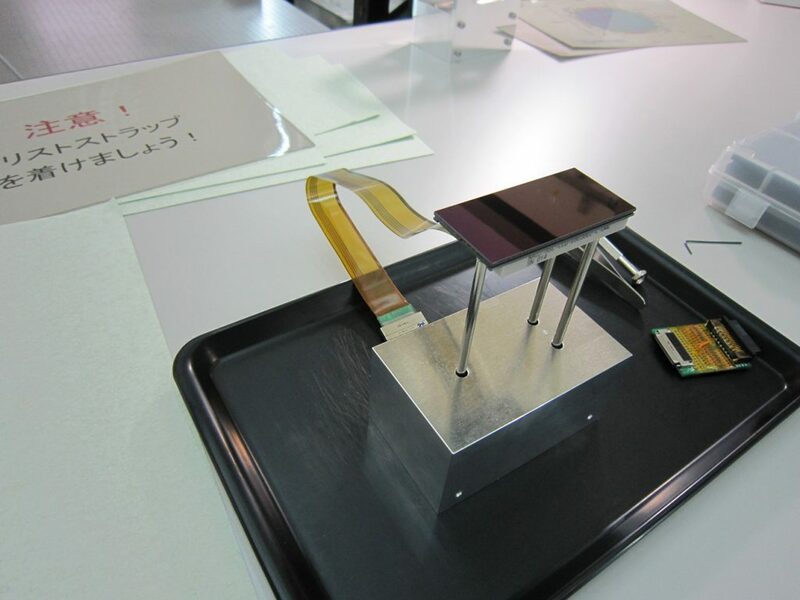 HSC employs fully depleted CCD with 2048×4096 pixel, developed by Hamamatsu Photonics in collaboration with NAOJ. The device are 200 um thick and pixel size is 15 um, subtending 0.17â€ on the sky. 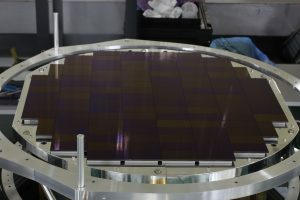 The CCD is glued to an AlN package which has pin grid array at the bottom side. With this four-side buttable package, the focal plane has a filling factor over 90%. Flatness of CCDs are very flat, measured to be 20 microns peak-to-valley, as required because of the fast f-ratio of the WFC. The CCDs are connected to the front-end electronics (FEE) developed at NAOJ. FEEs are located inside the dewar and CCD image data are digitized immediately. The back-end electronics (BEE) grabs the digitized image data and transfers them to the host computers located at the control building through GESiCA device, which is capable of transferring data up to the limit specified by 1 Gbps Ethernet. The time required to read all the CCDs is as fast as 18 sec. 116 CCDs (including 4 for auto-guiding and, 8 for auto-focusing) are tiled on the cold plate with 0.3 mm gaps between adjacent CCDs. The fast f-ratio of WFC leads to the shallow focal depth of +/- 30 um. The flat focal plane of HSC is achieved as follows. The cold plate made of SiC is polished to be as flat as 5 um. 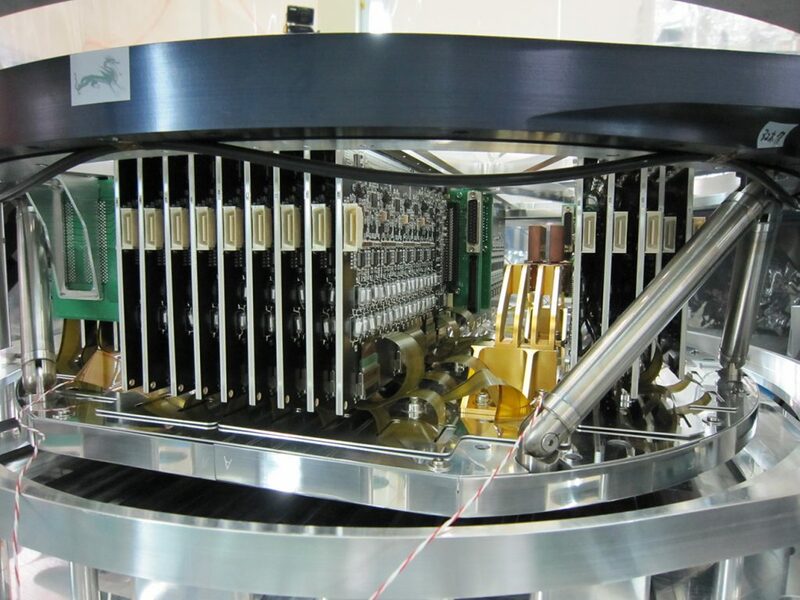 The height of each CCD package is measured and buffer block called ‘pin base’ is glued to the CCD package. Then the CCD packages, each with the same height are installed to the cold plate. This yields a flat focal plane with height variation of +/- 17 um. 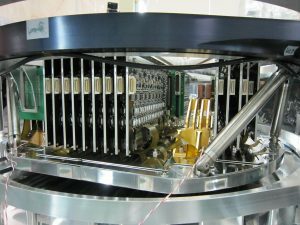 The focal plane assembly is supported by 6 thin stainless tubes to make the assembly thermally isolated while maintaining the mechanical stiffness. FEM analysis shows that the tilt and the displacement of the cold plate are 0.8 arcsec and 6.2 um, respectively, at an elevation of 30 degrees. 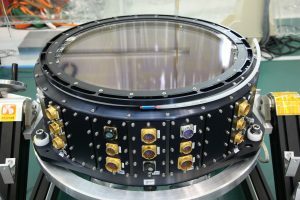 Two 50 W pulse tube coolers manufactured by Fuji Electric are employd to cool the focal plane CCDs down to -100 C, at which the dark current is well suppressed. The coolers are powerful enough to keep the CCDs to -100 C and uniform temperature over the focal plane. The dewar is evacuated down to 10-6 Torr to avoid the heat input by thermal convection. Ion pump is attached as a support to keep the inside of the dewar at a good vacuum. The print board circuit of the FEEs is a 2 mm thick aluminum core with a high thermal conductivity insulator, which effectively transfers the heat generated by the FEEs to the outside of dewar. Power supplies, electronics and miscellaneous devices are attached to the back side of the dewar, forming a rack. The rack is covered completely so that light from devices such as LED indicators does not escape. 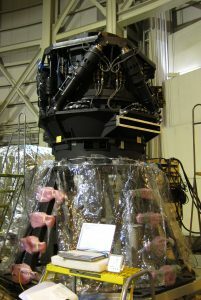 The heat generated in the rack is passed to the coolant supplied from telescope by heat exchanger located in the rack. FEEs installed on the CCD dewar. 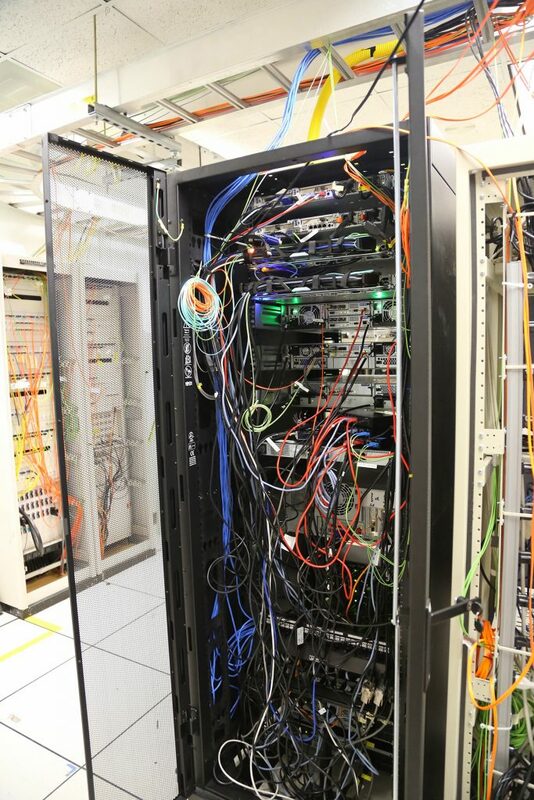 Flex cables from the CCDs are connected to the FEEs. Electrical rack and shutter are attached to the CCD dewar. FEU stacker is on the left. Focal plane tiled with 116 CCDs. Shutter with one of the sheets half opened. The top cover is removed to clearly show the interior mechanism. The shutter is the most active -working component in the HSC. It is a roll-type shutter, allowing it to open and shut over the 630 mm aperture in one second. A pair of ball screws driven by an AC servo motor ensures quick and accurate motion of the light-shielded sheet. 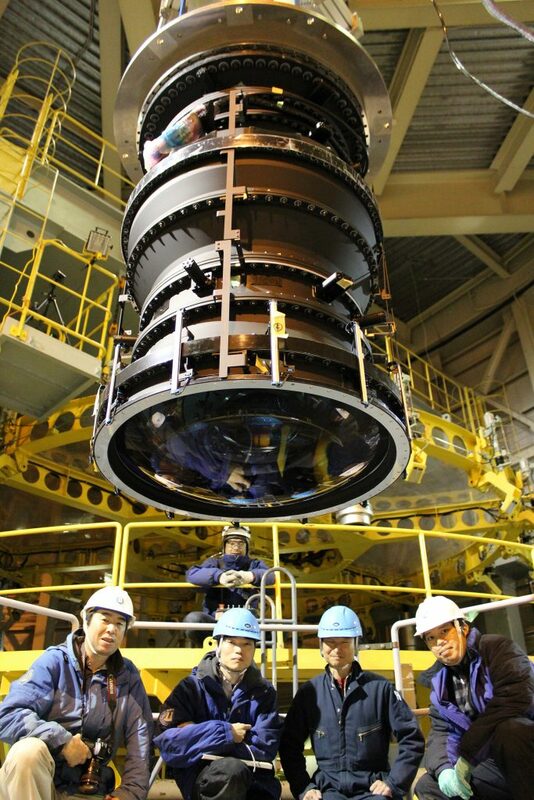 The shutter is 902Ã—742 mm in extent and is 60 mm thick, fitting in the limited space between the CCD dewar and the WFC. Since large colored glass of the size needed for HSC is not available, all the HSC filters are interference filters. Interference coatings are applied on both side of the substrate (synthetic silica or B270) to form a sharp bandpass. Although the uniform coating over the large aperture (effective aperture of 580 mm) is challenging, coating venders such as Asahi Spectra, Materion and Optical Coatings Japan have developed techniques to ensure the uniformity and meet the HSC filter requirements. 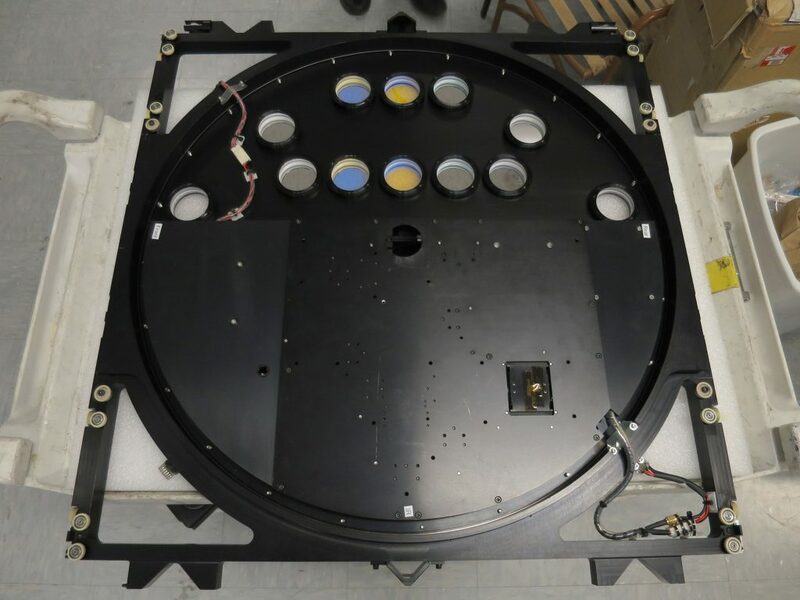 Standard broad-band filters (g, r, i, z, y) similar to those of SDSS are widely used for many scientific observations, and narrow-band filters to sample specific wavelengths with 10 nm band widths are also available. For more information, please visitthe HSC filter page at Subaru. A narrow-band filter on the transmission measurement machine. Since the interference filter reflects the light except for a specific transparent wavelength, a filter looks like a mirror as shown in the picture. FEU stacker attached to PFU for test. Filter exchange unit (FEU) consists of three components: two stackers which store three filters each and deliver a selected filter to/from a position in front of CCD dewar, and central unit which receives the filter and pushes it up to the CCD dewar to hold the filter steady relative to the CCD dewar during the observation. As such, FEU is a complicated machine which requires 60 steps to change a filter. 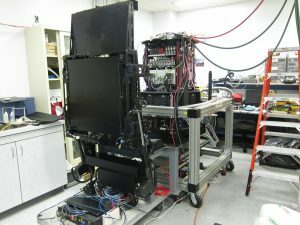 The stacker is installed separately to the PFU after the PFU is installed at the prime focus (currently, this happens one day after the PFU is installed). The filter is inserted through the opening of the PFU to the central unit which is attached to the CCD dewar. The FEU was designed and manufactured by ASIAA of Taiwan with close cooperation from ASRD and NAOJ. It takes up to 10 min to change filters, but additional 20 min is requested to close/open the mirror cover to protect the mirror from anything that might drop during the filter change process. 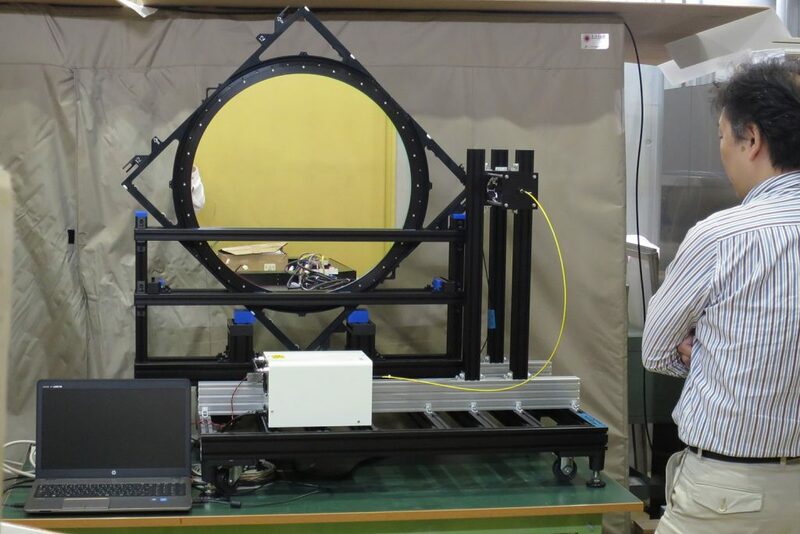 A special Shack-Hartman (SH) filter is used for optical alignment of HSC. This filter contains optics to divide the pupil image into 16×16 components which are then focused on a science CCD on the focal plane. By comparing the spot image with a reference image of perfectly aligned spots and calculating the necessary correction, the position of the PFU and the shape of the primary mirror can be adjusted. The optics occupies half of the SH filter and the other half consists of 12 small filters of different bands. Back side view of HSC computer rack with spaghetti of cables. Three computers are employed to handle the HSC instrument. 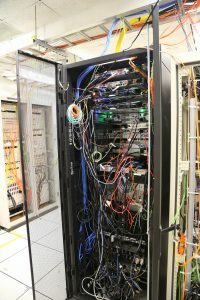 Two computers are dedicated to handle CCD readout; each takes care of image data from 56 CCDs. The third computer is a multi-purpose machine which handles the auto-guiding CCDs, works as mirror analysis server, monitors instrument status, and so on. The three computers communicate with each other and also with computers used for the telescope, data archiving and observation control.